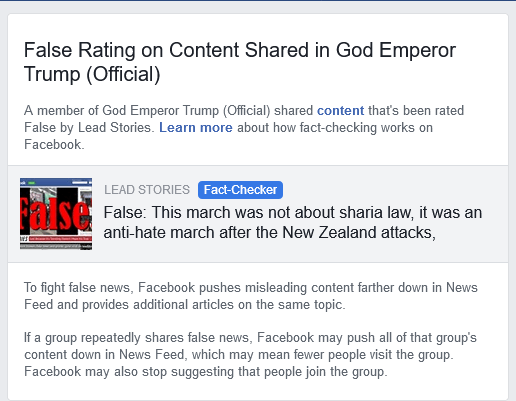 This week, someone in the Facebook group “God Emperor Trump: Official” posted an article that was deemed fake by Facebook. Admins of this community promptly received an official notification that the Facebook group could be penalized for such behavior, somehow suggesting Facebook group admins now fact-check and verify everything that's posted by members of the group. The official notification also stated that the platform might “stop suggesting that people join the group.” Note that the group is a relatively small community with 20K users. The group employs several volunteers who moderate their content and ensure that it complies to FB standards. The social media giant wants volunteers to research and verify posted content independently. While Facebook’s efforts may seem like a good idea to some, it is hard to moderate content and verify each story even if you have a team of professional journalists. We had multiple situations like the Covington incident or Jussie Smollett story that show how even trusted news sources often publish false stories. Another problematic possibility is that Facebook will deem satire and joke stories as news resulting in bans of comedians or memers. Many small and big news sources often employ satire. CNN, BBC, and NYT all have clearly satirical content that appears to be a real piece of investigative journalism. The Onion is another example of satire that many people often confuse with actual news. Admins of the group were puzzled with the notification. They have a dilemma now: is Facebook really suggesting that they need to fact-check everything that's uploaded to the group? Facebook, intentionally or not, creates a new battlefield for the culture war. Activists will try to use this new policy to intentionally post fake news in groups opposing their views and vice versa.